If you're looking for a great antivirus solution that's both comprehensive and effective, then you might be interested in ESET Smart Security. This suite of security tools includes most, if not all, of what you need to keep your PC as secure as possible. ESET Security Suite includes an antivirus program, a firewall, anti-spam module and a load of settings to keep yourself safe. The application provides two different modes: Advanced and Standard. 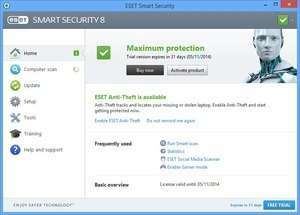 ESET Smart Security 10.2.145 is a shareware program and can be used as a demo to try the software until the free trial period has ended. A full version of the program is available after the trial period ends. For security reasons, you should also check out the ESET Smart Security download at LO4D.com which includes virus and malware tests. Additional screenshots of this application download may be available, too. 3 out of 5 based on 68 ratings.